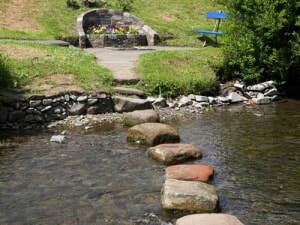 Jenny’s Well surfaces on the west bank of the Leithen opposite the picnic area beside the Cuddy Brig. The original spring provided fresh clear water for the nearby cottages and passers by, especially school children, who were in the habit of stopping for a refreshing cool drink. The well was named after Jenny Baptie who, for many years until she died a very old lady in 1915, sold home-made sweets from her cottage just across the road from the well. As the houses had long since been supplied by the mains the well fell into disuse and was buried during World War II. It remained hidden and almost forgotten until 1990 when it was excavated and restored by Innerleithen Civic Association.